9 seater Tempo Traveller on Rent is one of the luxury tourist vehicles which are mostly used for a group journey of friends or family. This vehicle offers 1x1 luxurious seating arrangements for 6 passengers with window seats and a sofa in the backside for 3 people. 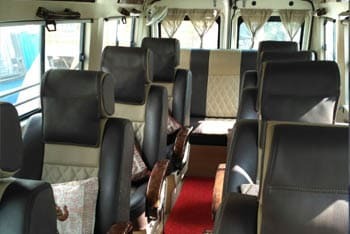 These Maharaja seats are very comfortable for any long destination journey even hill station or rough ways. This Tempo Traveller has very attractive interiors and the ideal vehicle for small groups of family or friends. We always suggest you that you should choose this vehicle for your group to avoiding any small cabs like Toyota Innova or Crysta. 9 seater Luxury Tempo Traveller is also used for local uses in Delhi such as Airport/Railway station pickup or drop, Hotel transfer and local sightseeing. The Air conditioner, LED TV, Music stereo system is the standard features of this vehicle that make your journey more entertaining. You can book this vehicle easily from anywhere in India or out of India just send us an inquiry or make a phone call to our representatives. We offer all North India Package with our tourist vehicles such as Shimla Manali Tour, Mathura Vrindavan Tour, Agra Jaipur Tour, Golden Triangle Tour and many more.